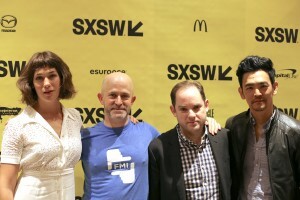 I met with writer/director Aaron Katz (Cold Weather) and two of his actors, John Cho (Harold & Kumar Go to White Castle) and Lola Kirke (Gone Girl), on Monday, March 13, 2017, at SXSW – the day after the movie’s premiere – to discuss their collaboration on Katz’s latest film, Gemini (which I also reviewed). The film is a simultaneous paean to and rebuke of the gauzy charms of La-La Land (i.e., Los Angeles), like a James Cain novel set in a hallucinatory dreamscape. Kirke plays Jill, personal assistant to a megastar played by Zoë Kravitz (Mad Max: Fury Road), and Cho plays Detective Ahn, assigned to investigate a killing in which Jill is implicated. Ostensibly a murder mystery, it is really a meditation on the rabbit hole of celebrity culture. Here is a condensed digest of our conversation, edited for clarity. Hammer to Nail: Aaron, last night at the premiere, you said that you had moved to Los Angeles since making your last film, and this movie feels like a love/hate poem/ode to the city. Please discuss your motivation for writing the story. Aaron Katz: Sure. I mean, it’s mostly love. Los Angeles is a complicated place, and I think that’s reflected in the relationships in the movie, between Lola’s character and Zoë’s character where…I wouldn’t say that their relationship is love/hate, it’s more like a very complicated love for each other. In L.A., I think the lines of friendship and professional relationships can get really blurred, especially in creative endeavors, and I also think the line between creative endeavors and business endeavors can get fuzzy. HtN: I didn’t mean love/hate between them. I meant your own interaction with the city. HtN: Where Occidental College is located. AK: Yes, Occidental College is there. Somewhere there’s a house where Obama once lived in. AK: Yeah, he went to Oxy. (laughs) So, I’ve had a chance to explore Los Angeles for the last 4 years, and honestly, I wasn’t so sure about moving to L.A., when I did that, but I really have grown to love the city and wanted to show some of the things that…you know, like Hollywood is a part of the movie, but also shooting in my neighborhood – shooting in Eagle Rock – and Koreatown and some other neighborhoods in the city. It’s a city that is so multilayered, I feel like I could live there for the rest of my life and still have someone mention a neighborhood in some suburb, and I’d be like, “I’ve never heard of it and never been there.” I think that’s what’s cool about Los Angeles. HtN: What I like about your approach to the city is that, on the one hand, you celebrate its excess, but on the other hand, it also feels very casual, in many ways. Lola’s character, in particular, is the opposite – in her dress and in her behavior – of the stars. I like that approach of sort of casual glamour. AK: Yeah, well we talked a lot about costumes and how that would be informed by the character’s history and we really made a conscious choice to have Lola dress in a certain way. (turning to Lola) Do you want to talk about that? LK: (beat) She was great in that. LK: But I think that even though Jill is behind the scenes in this industry, and is kind of the thing that is not celebrated or glamorized, it was interesting to locate this subconscious homage to Hollywood within her, in some way. And I think that something we had also talked about, when we were trying to figure out who Jill was, was that she’s in Hollywood, doing what she does because she loves movies so much. And I think that that is something that brings so many people to Los Angeles. Whether or not your passion is current cinema or this kind of mythic cinema of the past, I think that we found, in Jill, this idea that she was doing this grunt work for this movie star who probably stars in movies like Twilight, not that there’s…you know, not Hollywood classics…and that there was probably this unfulfilled hope that we might some day return to something that we will never will return to. AK: I think, when you’re living in Los Angeles, sometimes you end up feeling like you’re playing a part and everything can feel a little like a film set. Just like the architecture is so evocative of classic Hollywood, and the movies of the ’30s and ’40s. A book that I really like is called What Makes Sammy Run?, by Budd Schulberg, which is all about L.A. in the studio system in the ’30s, and I find myself sometimes just walking around in L.A. and feeling like the city still evokes that. I mean, people talk about the city as having no past or being such a new city, and there are really new places, but there’s also so much of the city looks like the 1920s, with Spanish Houses from the ’20s. HtN: Sure. And you can still find the house in which they shot Sunset Boulevard. These things exist. And the Griffith Observatory…there’s plenty of history in L.A.
AK: It mentions the intersection of Vermont and Franklin, which is depicted like this seedy corner full of people cruising around in their convertibles. JC: I think, also, that L.A. is not precious about its history, and its willing to tear one thing down and build another, and on the one hand, it’s kind of tragic, and on the other hand, it’s kind of refreshing. I mean, I like how everything is mismatched in L.A., too. AK: Yeah, everything’s like up against each other! AK: There’s an old building next to something that got built yesterday. JC: So, it feels kind of unselfconscious. AK: It’s the same place. We really wanted all of the locations to evoke something very specific about the city. So we really worked to find places that were great. JC:…which is the location for Blade Runner. HtN: It does! With that open interior staircase. AK: I mean, that layout is such a fun layout to see all the way across the building like that and see into the caged elevator. HtN: And it gives Jill the opportunity to look up and see the cops. It serves the story really well. HtN: Aaron, music is such an integral part of the film, and you discussed this last night at the Q&A, but please tell me what motivated your particular musical choices. It opens with a sort of techno-jazz score, you mentioned Tangerine Dream last night. What were some other influences? AK: Tangerine Dream and Giorgio Moroder, and people like that, are the starting place. We sort of moved away from that into something that I don’t exactly know how to categorize. We really wanted to emphasize music that the characters in the movie would enjoy listening to. On the one hand, it’s nostalgic, but on the other hand, it’s contemporary or even forward-looking. Yeah, Keegan [DeWitt] – our composer – and I just wanted to evoke the feeling of driving around at night in Los Angeles. And that was always the starting place when we were trying to lock in to what the score should be: does this work with the driving stuff? And then it needs to transition…(turns to John)…when you show up, the score changes and becomes a little more traditional, like there’s more strings and stuff. HtN: It mellows out a bit, with John’s arrival. HtN: It also recalls, a little bit, To Live and Die in L.A., though that’s more frenetic, but there’s a similarity in some of the tone. AK: Coincidentally, that film was playing at the New Beverly two weeks before we shot. Our DP [director of photography] and I went to go see it. I like that film, but I think it actually has an opposite take on L.A. Visually, it’s very orange and glowing, and I think we went in the opposite direction you can go in portraying the city. HtN: So, John, you’re great in the film, but it’s a very small part. You do a lot with relatively little. And you take a character who could have been a stock character and you make him integral to the plot. Why take a role this small? Again, you add so much to the film. JC: I liked the role! It was unusual. I hadn’t done that kind of role, before. And there was some history to him, just on the page, and then stuff that we added. When he approaches Jill first and says, “I have some firsthand knowledge of how you’re feeling,” I don’t know, I thought it was this sort of compromised detective, a little bit; a little emotionally compromised. He had some different colors. And I liked Aaron’s work and I liked him and I liked the script, and that’s kind of all the boxes I need to check. HtN: Right. I mean, it’s a part that is left purposefully enigmatic, and then you fill in the blanks with your performance, which I really appreciate. JC: Well, thanks! He’s a question mark like everyone else in the film, and I like that about that kind of character, so it’s not like “the cop.” He’s sort of explaining everything for the audience when he’s caught up in the milieu like everyone else. AK: And just to add to that, at the end of the film – I don’t want to go to much into it, for people who haven’t seen it – I feel like there is something enigmatic, like I’m not sure how compromised Detective Ahn is and how much is skepticism, with which you’re looking on to this situation. HtN: Is he really telling the truth that the case is closed? I mean, there’s almost an element of him still looking for cause. LK: Oh, hell yeah! I mean, why else would he show up? LK: Definitely. And that’s why I stare at him. AK: There’s this really tense triangle, when you look from Zoë to John to you, I feel like the three of you, and maybe Greta [Lee] all know what happened, although the versions of what happened are maybe different for everyone, and how much people are willing to say or admit are different. LK: I also think that there’s…and, again, this is spoiler stuff…that there’s just this idea that she’s going to be fine no matter what, because privilege buys you that, in our society. So let her squirm, under the gaze of Detective Ahn. JC: Yeah. And, you know, it’s possible…there’s another reading of it where he’s kind of a fan, too. JC: And sometimes cops are fans! HtN: Yes, although I did see him as a skeptical fan. There’s a look you give there…But Lola, I’m curious how Aaron pitched the role to you. If possible, it’s an even more intimate relationship between star and personal assistant than that in Clouds of Sils Maria. LK: I haven’t seen that movie, and I need to see that! HtN: You should! Kristen Stewart plays the personal assistant to Juliette Binoche. It’s a wonderful film. LK: No! Everyone keeps asking me that, though! Maybe I should get one! HtN: Seems like a great thing to have! I should get one! But how did Aaron discuss the part with you? LK: And she described the film, and it sounded really interesting, and I’d seen [Katz’s previous film] Land Ho!, but that’s like…I hadn’t seen Cold Weather, so I wasn’t aware of Aaron’s really bizarre…(looks at Aaron, laughs)…no, it’s amazing! It’s just unusual. His style of filmmaking where the tone is ambiguous until a point in the film and then you’re like, “Oh! It’s a mystery!” But otherwise it’s people saying intelligent things to each other and going through…very real people…I think that Aaron has really mastered the genre of suspense-minus-camp, like noir without the cheesy element of it. But anyway. I wasn’t drawn to the film because of my experience with personal assistants, but I was drawn to it because, I think…I have played these couple of roles where I stand in contrast to other women who are more powerful…I somehow end up in these roles where I am playing off another woman who’s older, or has a secret, or whatever, and this role is similar, in a way, to Tracy, the character I play in Mistress America, but she ends up getting to so much more and not just be a reaction or foil for somebody else’s eccentricities. And that was what was really compelling to me, that she gets to be brave. HtN: Well, thank you to all three of you for chatting with me, and congratulations on the movie!